Whether you require one room to be conditioned with a wall mounted, floor mounted or cassette split system we can design the perfect system for you. If you require multiple rooms to be air conditioned, then a fully ducted system or multi split system can be designed and installed to provide you with year round comfort. Split systems have an indoor unit that can be mounted high on the wall, at floor level, in the ceiling or even suspended from the ceiling. The outdoor unit can be fitted on brackets or on the ground and can be situated up to 20m from the indoor unit. Split System Air Conditioners are ideal for air conditioning one room or a specific area of a home. Discreet wall-mounted or compact floor standing units are available. 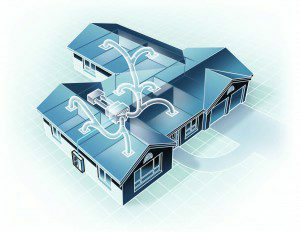 Split System Air Conditioners are available in ‘Reverse Cycle’ (Heating and Cooling). We can supply and install multiple indoor units connected to a single outdoor unit. This concept has proven to be extremely attractive in apartments and in other environments where outdoor space is at a premium. The indoor units connected in a multi split system are not restricted to wall mounted units. Depending on your budget you can go as far as having a combination of smaller ducted systems, floor mounted, Bulkhead or other indoor units. The combinations are endless and we will be delighted to explain the options to you so you get the system that’s best for you. Allworks Air supply and install ducted systems to provide air conditioned comfort to both new and existing homes. The indoor unit (fan coil) is usually installed in the ceiling or under the floor with flexible ductwork distributing the conditioned air through the vents or outlets throughout the home. The compressor (outdoor unit) is normally installed at the rear or side of the house. 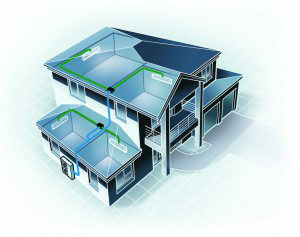 Ducted Systems can be designed to operate in one, two or more zones. This means you can operate the system in the living area during the day and the bedrooms at night. This can save you money on operating costs. When our company comes to you, we offer a full service to your machine, this insures that your air conditioners vital components are kept in good working order for a longer period of time saving you money in the long run.